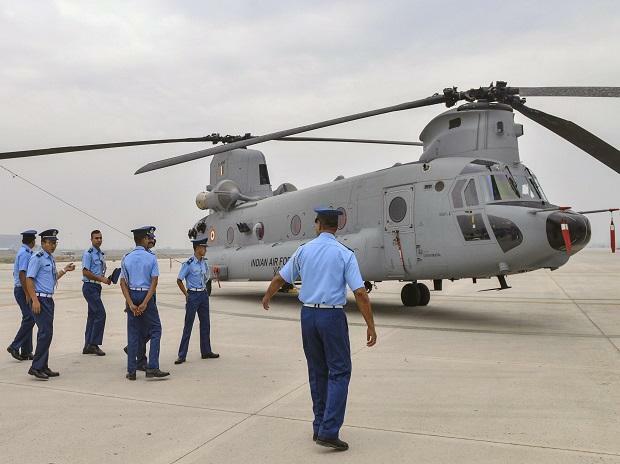 The Indian Air Force’s (IAF’s) first four Chinook CH-47F helicopters that Air Chief Marshal B S Dhanoa inducted into the fleet on Monday will swell within a year to a fleet size of 15 choppers. Senior IAF officers say that this $1.5 billion purchase from US firm, Boeing, which was signed in September 2015, will almost certainly be followed by an additional order. Given the Chinook’s utility, both in war and in disaster relief missions in peacetime, more of these helicopters are needed for a country India’s size. The Chinook replaces the Russian Mi-26 in the heavy lift class — the first helicopter category in which America has supplanted Russia’s dominance in India. Later this year, after the induction of Boeing’s Apache AH-64E attack helicopters, Russian Mi-35s will start being retired. Then, if the Sikorsky MH-60 Romeo is chosen as expected as the navy’s new multi-role helicopter (NMRH), Russia’s Kamov-28s and Kamov-31s will be shut out from a third category. The Chinook, with its distinctive double rotor, one at each end of the helicopter, is arguably the world’s most recognisable helicopter. It is one of Boeing’s biggest winners, with almost 19 countries flying 900 Chinooks, more than half of those by the US military. The Chinook first flew in 1962, more than half a century ago. The US Army intends to fly Chinooks into the 2060s, when it will have been in service for over a century. While the current Chinook CH-47F outwardly resembles the CH-47A that first hauled cargo in the Vietnam War, today’s version is far more capable. While the ‘A version’ could get airborne with a gross weight of 15,000 kg (cargo plus helicopter weight), today’s Chinook can lift 22,500 kg — one and a half times more. But the current CH-47F’s real edge lies in its avionics. Its digital advanced flight control system (DAFCS), enables the Chinook to hover at a precise spot, such as with its cargo compartment opening onto the edge of a building’s roof, allowing people marooned on the roof — say due to floods — to clamber on board. On a Business Standard visit to Philadelphia, where the helicopters delivered on Monday were being built, Chinook pilots explained that the flight computer allows a detailed flight route to be fed into the main computer. The chopper autonomously follows that route, coming to hover at the destination point. The pilot then manoeuvres the Chinook to where it is required by pressing a beep switch that moves the Chinook up, down or sideways in one-foot increments. “This is particularly useful when a group of Chinooks are operating together and their rotor wash is buffeting each other around. The computer caters for all of the turbulence,” explained the Chinook pilot. These user-friendly capabilities have been developed incrementally through decades of combat flying. Each time a Chinook unit returned from Iraq or Afghanistan, Boeing debriefed its pilots and maintenance staff in “after action reviews”. The crews were specifically asked what worked well in the chopper, what aspects they would like changed, and what they would never, ever want changed. “The DAFCS is invariably mentioned in the “don’t-ever-change” category. The pilots say it lets them perform precision missions today that they would never have tried earlier,” a Boeing engineer said. Like the indigenous Dhruv and light combat helicopters, the Chinook is tailored for high altitude operations. Boeing test pilots say they have flown a Chinook CH-47D over Mount McKinley — at 20,300 feet the highest peak in North America. In war, the Chinook will provide two vital capabilities to the army. It will boost artillery fire support by quickly transporting the M777 ultralight howitzer from one deployment area to another, slung by cables under the helicopter’s belly. In addition, the Chinook can quickly transport troops to a threatened sector, with up to 50 soldiers squeezed into each helicopter. In a conventional single rotor helicopter, 10 per cent of the engine output goes to the tail rotor, which is needed to stabilise the helicopter. But in the Chinook, the tandem rotors stabilise the helicopter, with all the engine power providing lift.